Precious metals expert Michael Ballanger discusses silver’s mercurial aspects. When I was a young lad, there was a classmate (let’s call him “Frankie”) in the very early years of my education whose behavior was quite often deemed as “peculiar” and while I found him immensely entertaining, the teaching staff and my fellow students did not entirely agree. Frankie was the kind of kid who would bang on our doorknocker on a frigid winter morning just before sunrise, fully clad in hockey skates, gloves and stick, and ask if he could skate on our frozen backyard hockey rink. The fact that it was a school day made it not exactly the brightest of decisions but my Dad would invariably say “Alright. You two boys have got 20 minutes then back in your houses to get ready for school.” It was never an outright rejection on the grounds of unsuitable behavior; it was more so an accommodation for the simple reason that 20 minutes of hockey at 6:35 a.m. in advance of school was a “noble enterprise” and certainly beat watching Captain Kangaroo over a bowl of Fruit Loops. Nevertheless, Frankie was indeed a maverick soul. He once had to have the local Malton Fire Department take a blow torch to the schoolyard swings so that Frankie’s frozen tongue could be removed from one of the steel legs. He once stole a pack of cigarettes from the teachers’ staff room and began selling them in the schoolyard. As the years rolled along, his behavior got more and more outrageous and he got into more and more trouble, but the funny thing was that he never, ever committed any prank or action that hurt anyone. He never got into fights; he never tried to tease other kids; he was always polite; and he never used bad language. One time when Frankie and I were sent to the “office” for putting glue on the chalk and when we finally were called on the carpet, the principal handed me a dictionary where the word “conundrum” had been highlighted in yellow after which he forced me to read it 25 times out loud. After that, he told me to turn to another page where he had highlighted the word “deviant” and told me to repeat the drill. I went through the next 10 years thinking of Frankie as a “deviant conundrum,” which was particularly taxing as the puberty years arrived creating an entirely different set of connotations for me to ponder. Other peccadillos like mood swings and unpredictability were common. One day he was an ebullient, infectious jokester; the next he would be a sullen, unapproachable recluse. He could be wildly funny in the morning and be tragically unhappy after lunch but when he was on his game, his company was nothing short of mercurial and that is why I valued his friendship and celebrate the memories of our companionship. As difficult as he was to figure out or predict, the mere specter of being present for one of his “up days” was the reason I hung around and, you know, it was kind of like owning SILVER. Since the peak in 2011 at around $50 per ounce, silver has been the financial equivalent of “Frankie.” It has always been the one metal that has earned the title as “disruptor,” ever able to attract the attention and the dollars of the monied classes with an equal dollop of animated debate. Whether it is water cooler discussions about its role as “money” or its subservient role to gold, silver is truly a “deviant conundrum” and never more so than to a so-called “expert” than me. Every time I think I have the next move in the silver market nailed, it winds up getting its tongue stuck to a frozen swing pole. Every time that the technical set-up, whether from the COT data or the chart configurations, appears bullish, it winds up getting caught hiding inside the training room clothes dryer after a 20-minute “tumble dry” runs its course. It has been at once the most baffling AND the most costly of all commodities to a great many investors, which most certainly includes this humble scribe. And why is that? What makes silver so difficult to assess, either fundamentally or technically? While I don’t believe that anyone has been able to figure it out, solving the silver pricing puzzle is like asking why colloidal silver is alleged to be such an incredible antibacterial agent. There is a term in behavioral finance called “recency bias” where investors are taking results over a relatively short period of history and assuming (incorrectly) that such results are going to be reproduced by modelling a portfolio in the same manner as the one that “recently” yielded satisfactory results. The second reason we silver bulls are constantly avoiding and evading the snapping jaws of the silver bears is that the major base metal mining companies are sitting on massive byproduct silver “slag heap” reserves that can be mobilized quickly (at least in a “hedging sense”) in order to buttress the earnings profile of a copper/zinc mining operation. Again, if the algos or the bullion banks in New York and London are aware of a 500-million-ounce silver resource sitting a few hundred meters away from the main production adit of a BHP copper mine, you can bet your schoolyard swing pole that they will have the CFTC allow them to categorize those “reserves” as “hedgeable.” If slag heaps containing non-43-101-complaint “reserves” are within three country miles of anything quantifiable, the bullion banks will take control of that “paper asset” and find a wayANY WAYto monetize it for the benefit of their quarterly P&L. What is painfully clear to me is that the silver market has multiple masters but no servants. The base metal giants that own the slag heaps care ONLY about JP Morgan’s sway over copper and zinc and could care less about silver. Because the large underwriting clients are hostages of the bullion banks, the traders at those banks can abscond with these inferred (paper) silver resources and utilize them as protection against short squeezes and the capital hits that would accompany such. They are able to classify their trades as “client hedges,” whereas in reality, if called for delivery, it would take years to be able to process that slag heap silver for “good delivery.” However, the regulators are not inclined to treat prop desk short sales in paper silver by the bullion banks as “speculative” rather than “hedges” where spec margin requirements would cause a massive drain on capital. The Old Boys Club is alive and well in the World of Finance. Then there is the issue of just how much silver is being held in the JPM vault and who exactly is the registered owner? Is this “client silver” or is it the property of the house account? Client confidentiality rules would prohibit disclosures but the same privacy protection afforded the client is how the banks can dance around the disclosure requirement of “pro” versus “client” trades. In this manner, the entire moral hazard issue of socialized losses and private profits comes to the fore but in the end, it all boils down to one group acting as one entity controlling the movement of an asset class and that is patently illegal. 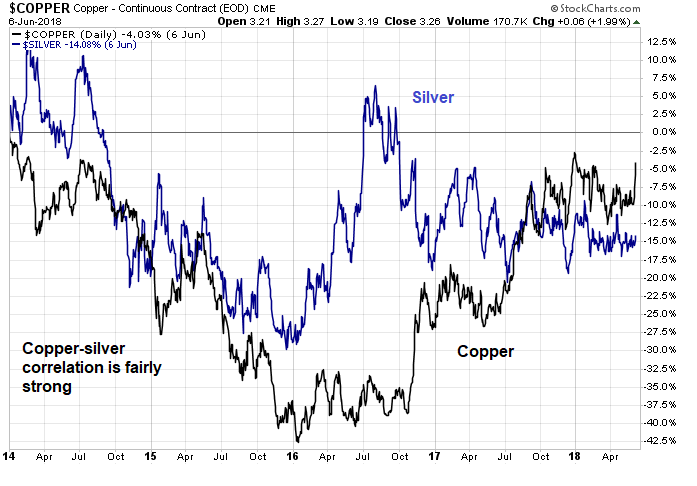 Despite all of the controversy and furor over the ongoing shenanigans in the precious metals arena, the biggest bet I made in 2018 thus far was selling the Gold-to-Silver-Ratio (GTSR) at 81.75 back in late March because while I was bullish on silver, I did not want to once again try to defy the history of technical “breakouts” and “breakdowns” that always seem to wind up in the “false” or “failed” category largely because of the role of the bullion banks. I instead elected to own silver (in size) but hedge it with a perfectly matched sale of goldin effect “shorting” the GTSR at 81.75 at the time silver was trading at around $16.80. Since that time, both silver and gold and gold have declined but on a percentage basis, gold has been hit much harder, such that the GTSR currently resides at 77.00 for a gain of 6.16%. In retrospect, had I gone “all in” on silver back in March-April, I would have been stopped out with a 10% (or more) loss so exercising the Prudent Man Rule and taking the high-probability trade rather than the far more potentially profitable “long outright” position in silver, I am now able to lift the gold short (at some point) and crystallize the gain while maintaining the silver position. The point where I might have covered was about two weeks ago when the RSI for gold approached 30 but today with RSI at 42, the urge to lift the gold short is less certain. With less directional certainty, the smart move is to simply hold the short GTSR position because even at 77, it is rangebound, but at the historically high end of its long-term extremes such as 30 in 2011, 50 in 2013 and 65 in 2016. My target for the GTSR is 65 by the end of 2018 but given the explosive potential for silver, that figure could be quite conservative given how rapidly investors have been ridding themselves of their ever-depreciating fiat cash reserves in favor of literally “anything else.” The term “cash is trash” made popular in the Inflationary Seventies has returned with a vengeance. I continue to look at all markets around the globe in astonishment as every central bank and/or treasury has created this gargantuan orgasmatron of printed money and credit, irrespective of nationality or location, which has in turn forced the replacement value of all assets in all nations to inflate. Whether or not the macroeconomic picture is shaky due to Fed “quantitative tightening” and its debilitating effect on the emerging markets, there is a torrent of cash sloshing around the world and its owners know only that its purchasing power is dwindling on a daily basis and hence, they jettison cash faster than an empty fuel cell as the race to own “assets” moves to fever pitch internationally. If you had a finite rate of money growth dating back to 2001, you could use copper as a barometer of economic activity in the same sense that lumber futures carry predictive implications for the construction industry. Since we have not had anything vaguely resembling “stable money growth” during the last twenty years, you simply cannot assign any of the ancient forecasting magic to copper. Nevertheless, the algobots programmed in pattern-recognition artificial intelligence know little if any of the Seventies markets and how the Vietnam War and the Arab oil embargo caused a crisis not dissimilar to the one we had in 2008. They look at the short term only and if copper is advancing, then it is statistically probable that silver will follow so the computer trading models are piling on to silver and copper this week and will continue until the trend reverses at which point they will all exit en masse leaving the carbon-based trading units writhing in agony on the trading pit floor. So, silver continues to forge ahead today with a solid 1.23% pop against gold’s anemic 0.03% rise, taking the GTSR to 76.72, a new low for the move. This deviant conundrum called silver has its good days and it has its bad days, but just as my childhood buddy would send people into fits of rage and bewilderment, he could also charm the wallets out of their pockets with a smile and a nod, and today silver is smiling and nodding and life in the world is once again good, bursting wallets spilling out onto tables everywhere. ← Ethereum has taken the world by storm…but how does it work and why is it becoming so popular?